I like making my own cashew milk because its rich and creamy and it tends not to split in coffee or tea. I won’t lie and say I never buy store bought plant milks (because I do), but I try not to do so all the time because commercial manufacturers do add rather a lot of extra unnecessary additives. (However, as with cow’s milk, they do fortify these milks as well, so remember to adequately supplement your diet if you decide to eschew the commercial plant milks entirely.) Of all the homemade plant milks I’ve made, cashew milk is my most successful one and everyone who has tasted it has loved it. It passes my “milk and cookies test” meaning it is delicious served neat in a glass with a cookie for dunking. Cashews are also a great source of copper and a good source of phosphorus, magnesium, manganese and zinc. Its also great news that regular nut eaters tend to be slimmer than non nut-eaters and are also at a reduced risk of developing cardiovascular and coronary heart disease, gallstones and Type 2 Diabetes. Just stick to your portion sizes of roughly 1/3 c of nuts per day. I make my cashew milk quite extra thick and creamy, but if you want a thinner drink, just add more fresh filtered water in 50ml increments until you get the consistency you like. I also recommend buying cashew pieces because its often cheaper than buying whole cashew pieces. If you’re buying in bulk, make sure you store your cashews in the fridge (for up to 6 months) or the freezer (for up to a year). 1. Soak your cashew nuts overnight (or for at least 4 hours) in 2 cups of fresh filtered water with the medjool date and a pinch of salt. You’ll be amazed at how plump and moist the nuts will become after even just a few hours of soaking. 2. After soaking, drain the pre-soaked nuts (and de-pitted medjool date) and add them all to a high speed blender with 4 cups of fresh filtered water. You can now add a pinch of cinnamon and 1/2 tsp of vanilla. This is optional, but I highly recommend it because of how delicious it makes the end product! Blend this mixture on a high speed for 1-2 minutes, depending on how powerful your blender is. 3. Strain the mixture through your nut milk bag* and store in a jar or milk bottle in the fridge. It will keep for up to 3 days. Tip: You can save any remaining strained nut pulp by freezing it and adding it to cookies or other baked goods at a later date, however if you have a high speed blender, you’re unlikely to have much or any pulp leftover. *I’ve popped in a few affiliate links into this post, directly with Nutri Ninja (worldwide) and Amazon (UK), so if you’d like to support what I do here at Our Little Organic Life, then please do shop via these links – you don’t pay any more and I get a small commission. Thanks! This entry was posted in Essential Oils & Natural Foods, Paleo, Real Food, Recipes, Uncategorized, Vegan, Zero Waste and tagged cardiovascular, cashew, cashew milk, cashew mylk, cashews, cooking, diabetes, diy, do it yourself, drink, drinks, eco, ecological, environment, environmentally friendly, food blog, food blogger, green, green home, green kitchen, health, healthy eating, heart, homemade, homemade cashew milk, homemade cashew mylk, how do I make cashew milk, kitchen, make my own, mason jar, milk, milk bottle, mylk, nut, nutri ninja, Nutrition, nuts, plant based, Real Food, recipe, reducing risk, vegan, vegetarian, Wellness, Zero Waste on May 7, 2018 by Our Little Organic Life. You know, I can take or leave most sweeties. Cakes & cookies. Pies & palmiers. Trifles & tortes. Biscuits & brownies. I like them, but could easily live without them. I do have a sweet tooth but it its usually reserved for my one special love: ice cream. Which has always been a real shame for me, because most ice creams and frozen yogurts on the market are pumped full of either refined sugar (a toxin) or worse, aspartame (a neurotoxin). I also find that frozen dairy (UPDATE 2018: I’m vegan now) never sits that well in my tummy and as I’ve been experimenting with raw vegan recipes lately, I’ve noticed a trend amongst the food blogging community for throwing frozen fruit into the blender and serving it as soft serve ice cream. I’ve totally followed the crowd on this one. But why not? Its so much tastier and healthier…and MUCH easier to make than the process of churning homemade ice cream I remember from my childhood, which involved pre-freezing the metal canister, making a custard, then waiting AGES for the ice cream to finish churning around. 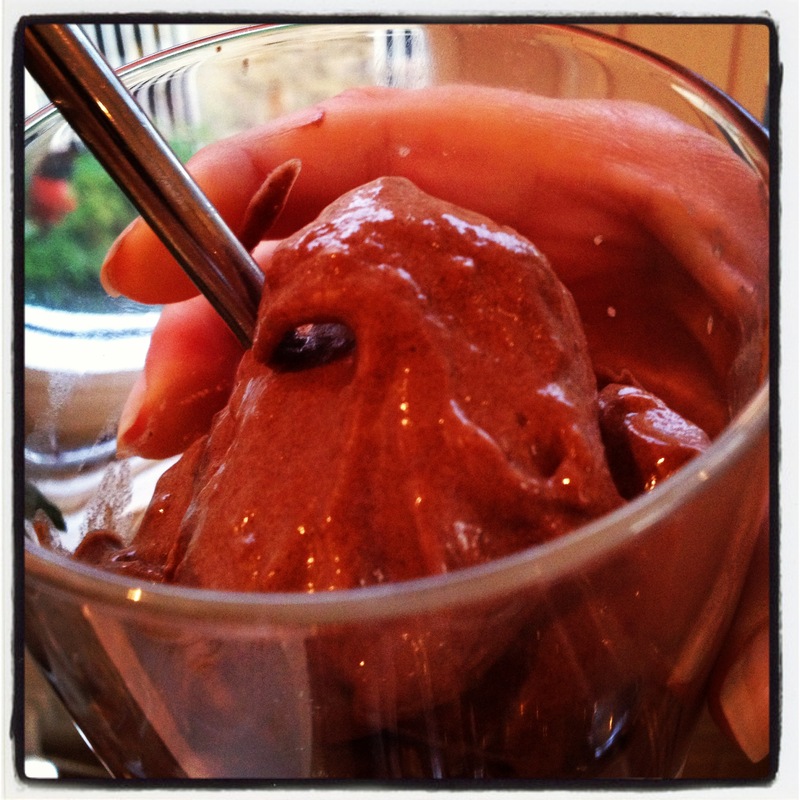 This recipe is vegan, free of refined sugars and naturally fat free. It is also “raw” if you use the cacao powder option and leave out the maple syrup, but I’m not too bothered about that. I’ll admit…its not a great photo, but quite frankly, I was far less interested in food styling my dessert than I was in eating it! Peel 3 medium sized over-ripe bananas and freeze them overnight. Once the bananas are frozen hard, take them out of the freezer and give them a rough chop, toss them into your high speed blender or food processor* along with the maple syrup and cocoa powder. 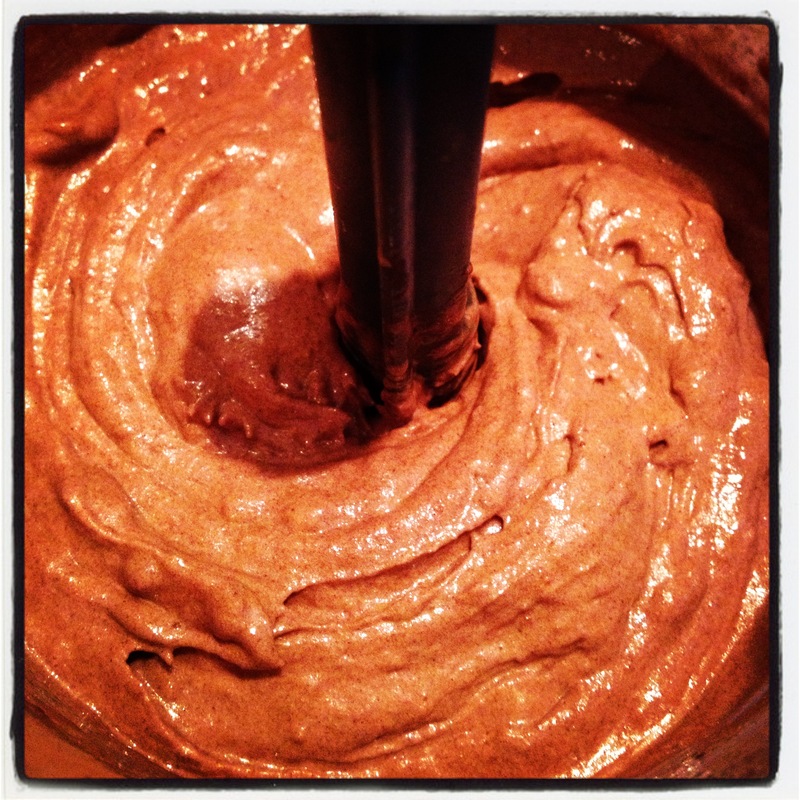 If you want a milk chocolate appearance – like old fashioned soft serve – use 1.5 Tbs of cocoa powder. If you want a rich uber-dark chocolate appearance like an Italian gelato, use 3 Tbs of cocoa powder. Whiz everything around in a high speed blender* for about 2-3 minutes. It will be loud and crashy-bashy sounding, but at the end, you’ll end up with smooth, rich ice cream which you can either eat right away or put into a tupperware and freeze for a hard ice cream later on. If you want to make it look like a soft serve ice cream for children, just pop it in a piping bag with a wide star tip piping nozzle and immediately pipe into the cone or dish. *This post contains affiliate links to Nutri Ninja, the brand of blender and food processor I’ve been using for a few years now, so if you shop using my link you won’t pay anymore, you’ll get free next day delivery and you’ll be helping to support my blog. This entry was posted in American & Canadian, Baking & Desserts, Gluten Free, Recipes, Vegan and tagged banana, bananas, chocolate, dessert, eating london, england, food, free delivery, free from, gluten free, hard serve, ice cream, ice cream cone, london, nice cream, nutri ninja, raw, refined sugar free, soft serve, vegan, vegan dessert, vegan ice cream on September 7, 2013 by Our Little Organic Life.